The fifth stop on Supreme Master Ching Hai's 2000 Lecture Tour of Oceania and Asia was Hong Kong on May 2. That day, a torrential rain turned the initially hot, dull Hong Kong weather into a cool and refreshing climate. Although it was still raining that evening, several thousand earnest Truth aspirants were not deterred from visiting the lecture venue, Queen Elizabeth Stadium in the city's Wan Chai district. Soon after midday, many people were already lining up outside the Stadium. 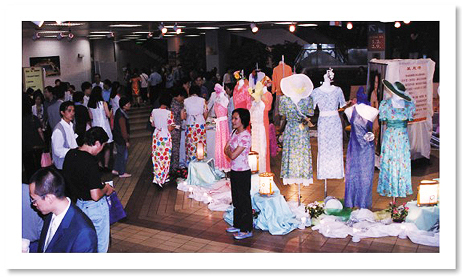 Around six in the evening, the Stadium was brightly lit inside and out, as anxious guests began to pour into the entrance hall and flood the exhibition lobby on the second floor, where Master's publications, Celestial Jewelry and Clothes were displayed. The faces of all the visitors reflected great admiration and praise for Master, and the seats inside the stadium were fully occupied before 7:00 PM. 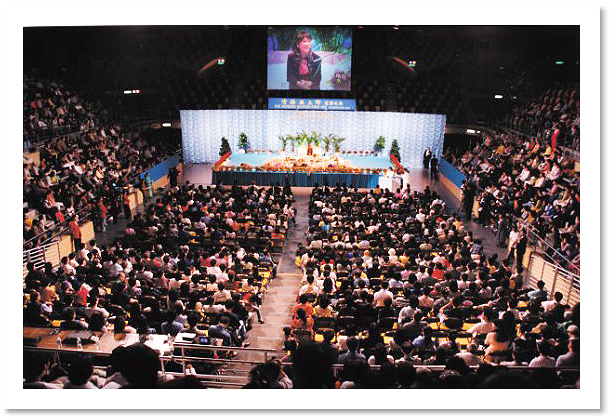 On a big screen high in the middle of the hall, a short video introducing Master, "Walk the Way of Love," was shown, after which a Hong Kong initiate shared his experiences on the spiritual path with the audience. 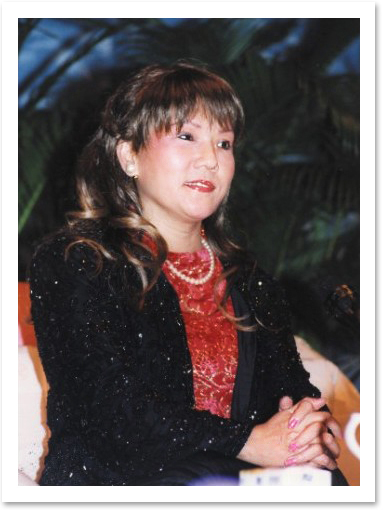 At that time, Master entered the lecture hall in a graceful and elegant manner, and the room was immediately drowned in thunderous applause, while the excited audience members rose to their feet to greet Her. Despite the fatigue caused by Her arduous journey, Master maintained a relaxed and humorous demeanor, while infinite mercy and love naturally flowed from Her. With words of humor and wisdom, She caused the whole audience to laugh delightedly and applaud continuously. Master's talk was lively and simple, yet easily understood, pointing directly to our inner Self and wisdom. Citing ancient sages and familiar experiences of daily life, She pointed out that even the greatest happiness on Earth cannot match the real happiness we discover when we silently find our Original Self within. Spiritual practitioners easily feel contented because they are free. They are not attached to poverty or wealth, since they have already found their True Self. She gave the example of Shakyamuni Buddha,who had a great kingdom and all the glory and wealth in the world, yet it was only after attaining full enlightenment that He possessed everything and became truly rich. With words of humor and wisdom, Master points us directly to our inner Self and Wisdom. The truth is, only when one really possesses fortune and happiness can one give real fortune and happiness to others. Only when we have truly found our inner wisdom can we point out to others where wisdom lies. All the holy scripturestell us that God dwells withinus. Master posed the question, "Then why can't we find Hirm?" And responded, "It is because we regard ourselves as humans, spending all of our time doing human work, thinking in the human way, and struggling for the survival of this human body. We forget that we are God. If there were someone who could tell us the Truth, help us remember our Original Self and that we are God, then it would be very easy; there is nothing mysterious about it." Master stretched out Her hand to show that getting enlightenment is really as easy as turning over one's palm. Through enlightenment we come to realize that the God Nature is within us, being an innate quality that we possess from birth. Only through rediscovering it can we realize that we all have the same God Nature and that we are originally one, without any discrimination between friend and foe, or me and you. Then we truly become peaceful and harmonious, and can bring real peace into the world. Suppose we have carelessly injured our finger or another part of our body. This injured part will annoy us all day and not allow us to eat or sleep in peace. However, this is no reason to chop off the part; instead, we should try to heal it. After finding our God Nature, it is easy to love our enemies. Everything is easy. We are happy living in a palace or in a tent; we are comfortable with wealth or poverty; we feel great wearing fancy clothes or simple clothes. Nothing can make our heart waver. That is why Shakyamuni Buddha told us that all things on Earth are illusions; only finding our True Self is eternal. Jesus Christ also taught us that our treasure is not in this world, but in the everlasting heavenly kingdom. We always direct our attention outwardly. That's why we forget our True Self. As long as we look inwardly, we will know that we are God. There is a statement in the Buddhist scriptures: "Lay down your slaughtering knife and become a Buddha instantly." In fact, just by laying down this world, we immediately enter the kingdom of God. Heaven iswithin us; we can find it as soon as we reach inside. People eagerly desiring more information about Master's teachings. Although Master's lecture was not lengthy, Her simple, yet profound, explanations were exceptionally powerful, and hundreds of people received initiation immediately afterwards. There was even a reporter from the press who asked to learn the Convenient Method after listening to the lecture. Apart from local Hong Kong residents and visitors from abroad, many Truth aspirants also came from every corner of Mainland China, including elderly people and young children. After the initiation, all the new Quan Yin practitioners beamed with infinite bliss and satisfaction. A young fellow from Guangdong Province in China looked exactly like a youthful Maitreya Buddha, with his plump and laughing face. A little girl who had very good experiences during the initiation told us that she loved the initiation; she felt really blessed for being able to see our beautiful Master in person. There were also some people who were accompanied by their initiated relatives, who had traveled great distances to get initiation, and their faces clearly showed their joy. Having received initiation and enjoyed wonderful experiences, they said that they had forgotten all the hardships of their journeys, and only gratitude remained in their hearts. Master's blessings encompassall sentient beings; She wakes us up so that we can escape from the illusory world and find our True Self and God Nature. She enablesus truly to realize that all parts of Creation are one, and further, recognize the true Love that has existed within us since the beginning of time. Master's art designs silently convey the beauty of Truth.